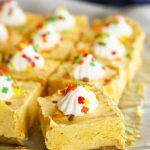 No-Bake Pumpkin Cheesecake Bars are a simple & easy dessert recipe that’s perfect for Halloween parties, Thanksgiving celebrations & more. Do you love pumpkin? 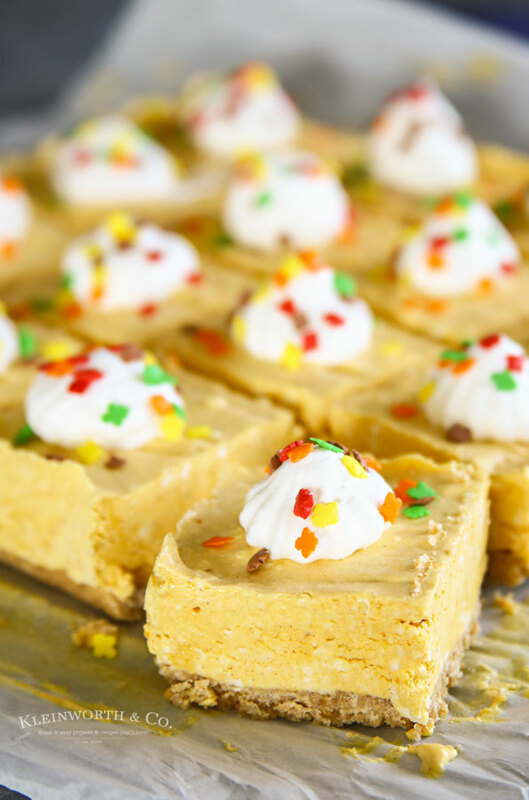 This time of year almost everything we make includes the favorite fall flavor of pumpkin, including these super easy No-Bake Pumpkin Cheesecake Bars. 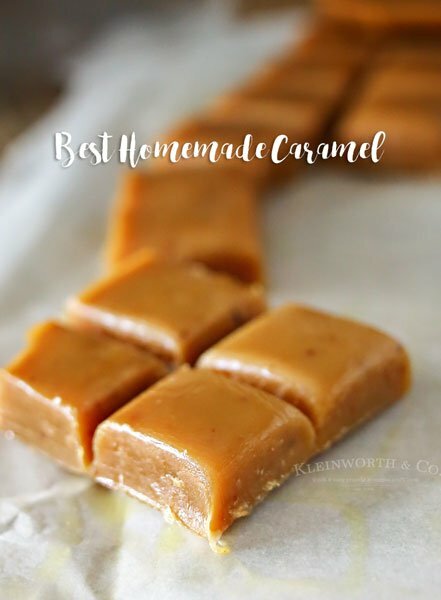 We love making this recipe for all our fall holidays. I can’t remember the last time we celebrated Thanksgiving without having these tasty little bars to end the meal. These are also really great for holiday parties at work, bunco night, Halloween parties for the kids & so much more. This post contains some affiliate links. Click here to read my full disclosure policy. 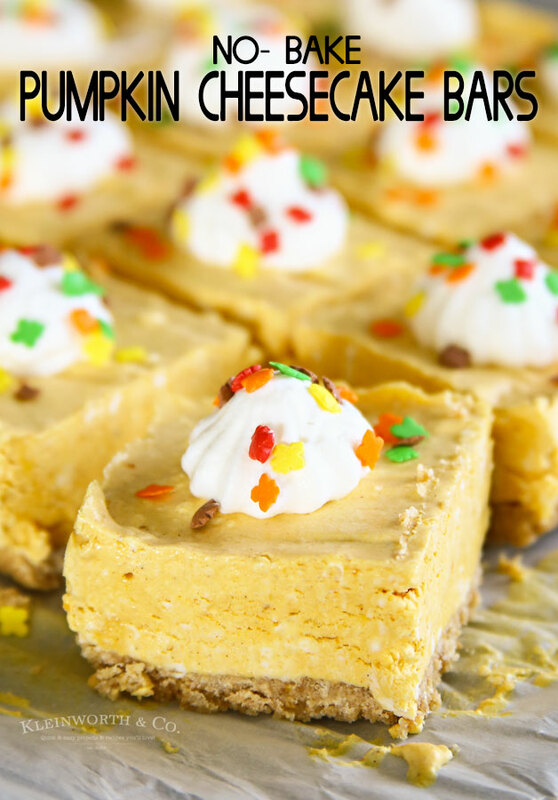 We love this recipe because not only does it blend two family favorites, pumpkin & cheesecake, but it’s also a no-bake recipe. If you have never made a no-bake cheesecake before, you don’t know what you are missing. It is quick & easy! Honestly, the hardest part is waiting for it to set after mixing it. What can I say, we love pumpkin cheesecake around here. I really love that it doesn’t take all day to make either. I can whip it up a couple hours before heading over for bunco night & by the time we are ready for dessert, it is ready to be enjoyed. You really can’t go wrong there. It is great for Halloween parties at the office or Thanksgiving dinner when everyone gets to bring a dish. I’m telling you, this will definitely be the recipe that disappears first AND everyone will be asking for the recipe. Because really, who wouldn’t love a quick & easy dessert like this one? Here are some commonly asked questions. How long does no bake cheesecake take to set? 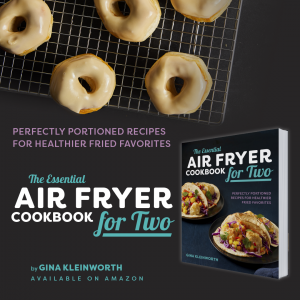 This particular recipe doesn’t take too terribly long. Some recipes require chilling overnight. But this one sets in about 3 hours. What is the difference between pumpkin pie filling and canned pumpkin puree? The canned pumpkin puree is just pumpkin. The pie filling is basically pumpkin puree PLUS sweeteners, spices and other ingredients already mixed in. 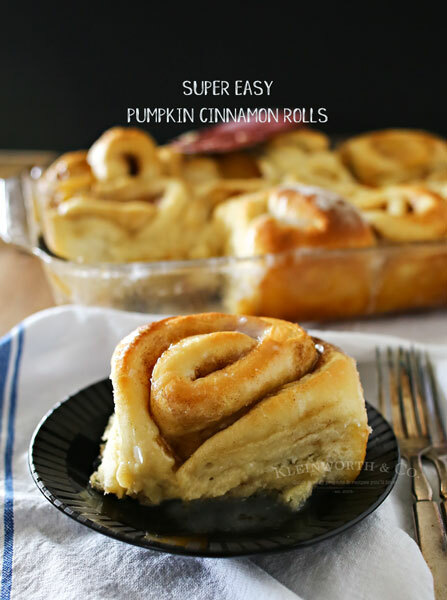 You don’t want that for this recipe because we are adding other sweeteners & spices. Be sure to get the pumpkin puree. Can no bake cheesecake be frozen? Absolutely. In fact, I often pop mine in the freezer instead of the fridge to speed up the chilling process. I always think I need it sooner than I do, so in the, freezer it goes. Then I get busy or forget & there it stays until I remember again. It always holds up quite nicely. Also, freezing is a good option if you have to travel with it. By the time you travel to your party & it is time to serve, it will be perfetly thawed & ready to be enjoyed. Combine graham cracker crumbs, melted butter & granulated sugar & mix. Transfer to baking dish & flatten out. Place in freezer to set. 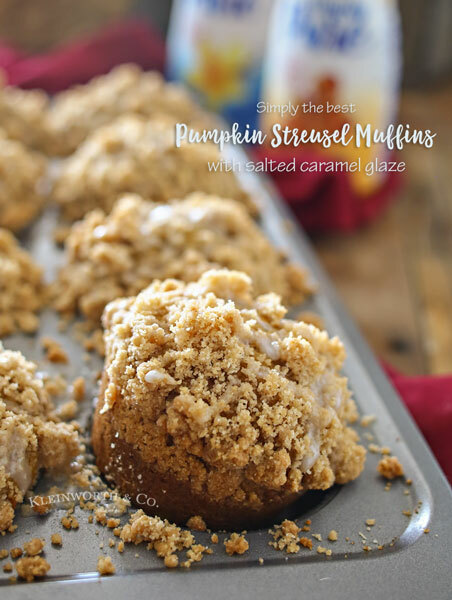 Beat cream cheese, pumpkin, granulated sugar & pumpkin pie spice together. Fold in thawed whipped topping. Spoon into chilled crust & refrigerate. 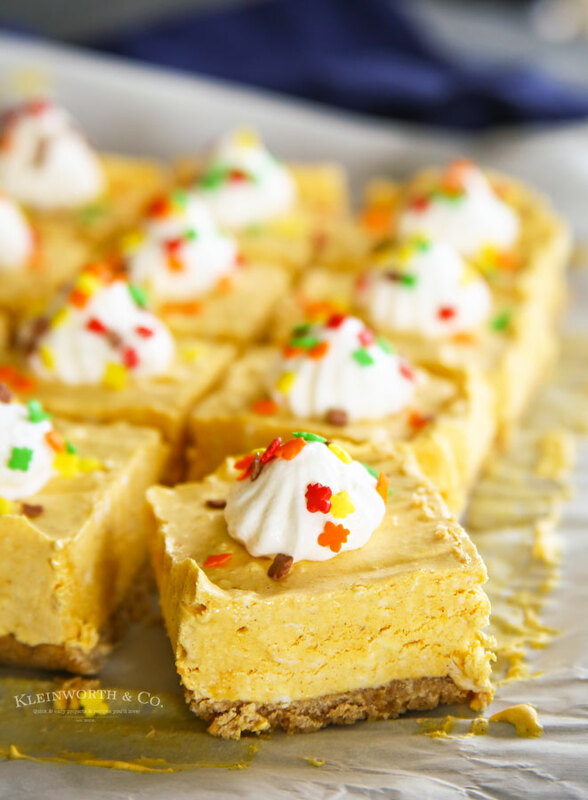 Cut into squares & top each square with a dollop of whipped topping & fall sprinkles. Now I like to add whipped topping & fall sprinkles to decorate these bars. But you could just as easily use nuts, chocolate candy bits, toffee or anything else that strikes your fancy. Whatever works for you goes great with this no-bake cheesecake. How can you go wrong with that? 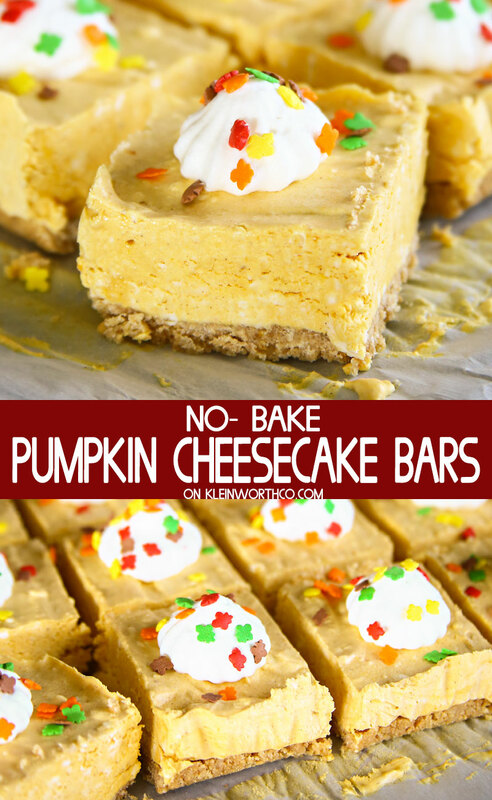 These are the best no-bake pumpkin cheesecake bars around! 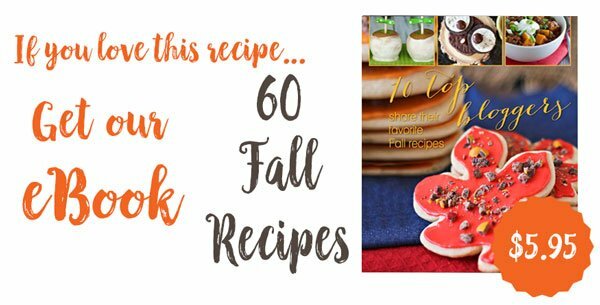 Looking for more fall favorites? 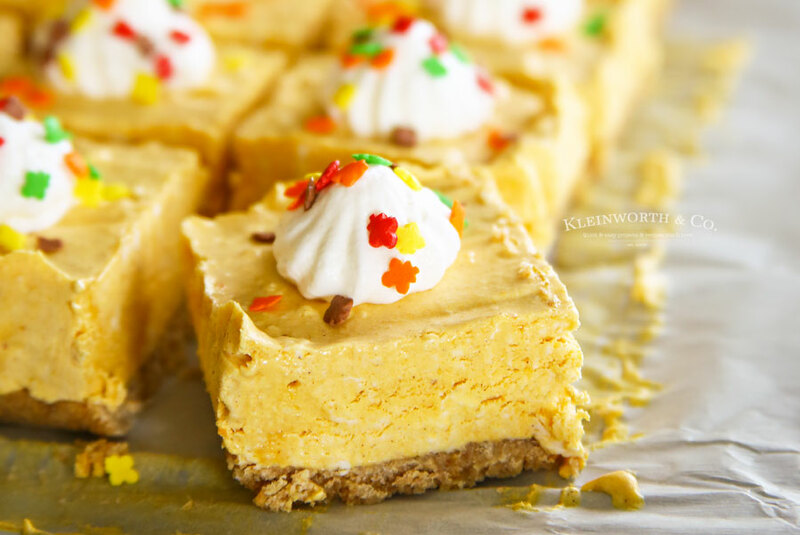 No-Bake Pumpkin Cheesecake Bars are a simple & easy dessert recipe that's perfect for Halloween parties, Thanksgiving celebrations & more. Combine graham cracker crumbs, melted butter & 1/3 cup granulated sugar in a small bowl & mix until all crumbs are moist. Transfer to a 9×9 baking dish lined with parchment paper & press firmly to flatten out into a smooth layer. Place in freezer to set while you mix your cheesecake. Beat cream cheese, pumpkin, remaining granulated sugar & pumpkin pie spice in a large mixer bowl until well combined. Fold in the thawed whipped topping. Spoon into chilled crust & refrigerate at least 3 hours or until firm. When serving, remove from pan by pulling up on parchment paper, cut into squares & top each square with a dollop of whipped topping & fall sprinkles. Don’t miss these great ideas from these bloggers…. Those sprinkles are so adorable! 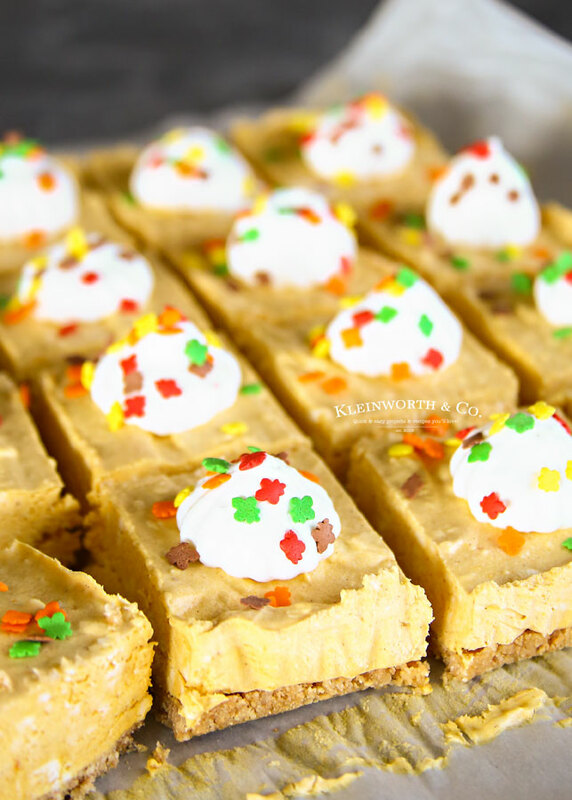 These Pumpkin Cheesecake Bars look perfect for the season and so easy! Thanks so much for sharing your post with us at Full Plate Thursday, we have really enjoyed it. Hope you have a great day and come back soon!